Weird messes sometimes require weird remedies. The Republican Party, state and national, is in a huge, weird mess because of the ongoing situation involving Judge Roy Moore. Because of the nature of the allegations, the timing of the allegations, and the complicated interplaybetween state law, state party rules, and Senate rules, there is absolutely no good solution for Republicans or, frankly, for Moore. But after puzzling out numerous options, I think the least bad idea is an ingenious bit of political jiu-jitsu I saw on Twitter. (Alas, it was a ReTweet of a ReTweet, or something like that, and I don’t remember whose idea it was originally, or I would credit him/her.) 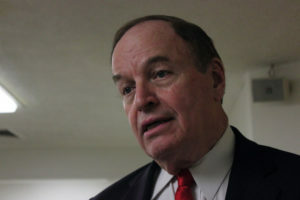 The short version is that a write-in campaign should be organized… for current U.S. Sen. Richard Shelby. What? Come again? The immediate response is to ask how it would help to write in a current senator’s name for an open Senate seat. The people of Alabama would be well served if both Roy Moore and Doug Jones withdraw from the December 12 election, with both major parties formally acquiescing, effectively forcing the election to be postponed until November of next year. Both candidates, or either, could run again next year, but without the circus atmosphere, confusion, and doubts engendered by post-primary allegations of super-serious moral transgressions by Moore. Elections are meant to serve the public interest, not the ambitions of candidates. Yet if the election is held in three weeks, almost any result will be seen as at least a somewhat illegitimate reflection of the actual will of the Alabama majority. For purposes of this thought experiment, let’s assume that the two worst allegations against Moore – the disrobing and sexual touching of a 14-year-old, and the forceful groping and threatening of a 16-year-old – are not true….